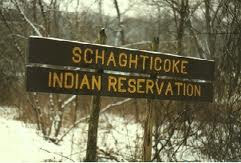 A superior court judge has ordered a non-Indian man to leave the Schaghticoke Tribal Nation reservation in northwest Connecticut, where he has cut down dozens of trees and has damaged acres of land. In addition to evicting the man, the ruling also settles a long-running dispute over the tribe’s governance and leadership, affirming that the Schaghticoke Tribal Nation, not a faction that calls itself the Schaghticoke Indian Tribe, is the tribe’s legitimate governing authority. But equally important, says Schaghticoke Tribal Nation Chief Richard Velky, the ruling will help the nation in its campaign to regain federal acknowledgment. That recognition—granted by the Bureau of Indian Affairs (BIA) on January 29, 2004—was revoked in an unprecedented move by the BIA in 2005, after a relentless 18-month lobbying campaign by Connecticut politicians and the very powerful lobbyist for a group of wealthy anti-casino landowners, Barbour Griffith & Rodgers, and at least a dozen municipalities in the state. Connecticut Federal District Judge Peter Dorsey dismissed the tribe’s appeal of the reversal in 2008, based largely on the fact that he believed federal decision-makers who said they were not affected by the tsunami of political pressure put on them. That political influencing was so blatant and the reversal-process so notorious that one Indian law attorney in Washington recently called it “a shameful example of all that’s wrong with the federal recognition process.” . . .